An image of Freddie Mercury is to appear on the tail fins of two aircraft belonging to airline Norwegian. The company have made the move to celebrate what would have been the late Queen frontman’s 71st birthday on September 5. Mercury is the latest name to appear on the airline’s ‘Tail Fin Heroes’ campaign which has previously featured footballer Booby Moore, author Roald Dahl, pioneering pilot Amy Johnson and aviation maverick Freddie Laker. Norwegian’s chief commercial officer Thomas Ramdahl says: “As Norwegian continues its rapid expansion in the UK, our ‘tail fin heroes’ offer us a perfect chance to pay tribute to some of the greatest Britons of all time. 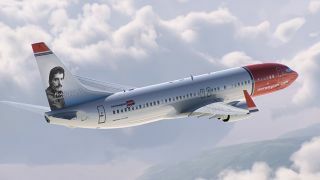 The first Freddie Mercury tail fin will take to the skies this summer when it will adorn a Norwegian Boeing 787 Dreamliner aircraft. Earlier this week, Queen and Adam Lambert unveiled a new virtual reality experience titled VR The Champions, while the band recently released a new version of Monopoly based on life on the road with Queen.